/ How do I snooze a message in Gmail? How do I snooze a message in Gmail? I heard that Gmail now has a snooze feature. What exactly does it do and how can I start using it? My first assumption when I heard about a “snooze” feature was that it would somehow either stop you getting notifications at night or that you could defer sending an email so you could “sleep on it”. Both are wrong. Turns out that the snooze feature in Gmail is focused on incoming mail and that it’s built around the assumption that you deal with everything in your inbox immediately. Tech industry people even have a buzzword for this sort of email strategy: “inbox zero“. I know lots of people who have hundreds or thousands of messages in their inbox, however, which would drive me a bit bonkers, but works for them. In that situation, quite honestly, the snooze feature really isn’t going to be of much value. If they want to reform their ways  it can be a way to start working towards that inbox zero concept, however. In other words, your inbox becomes just mail that you haven’t “dealt with”, either responding, deleting or saving. Let’s look at the snooze feature and you’ll see how it can help you learn to tame your overflowing inbox. 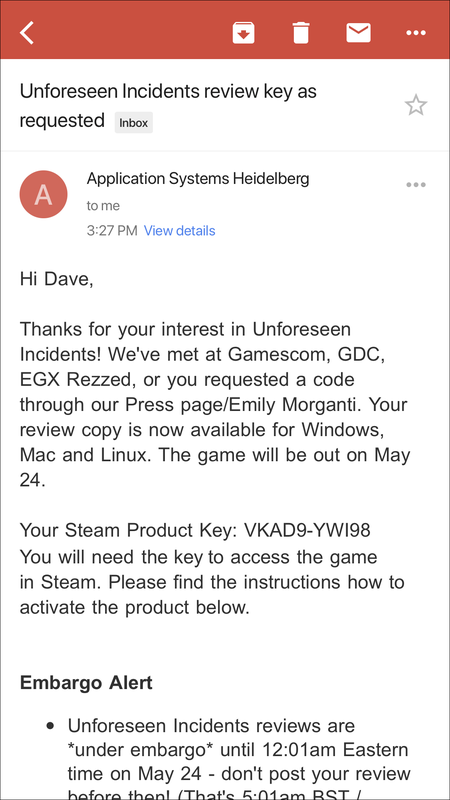 The content of the email isn’t really important (and that’s not a proper Steam product key if you’re suddenly eager that I’ve given something away  ) but the message itself has arrived at an inconvenient time. I can just let it sit in my inbox, but if I get 10-20 messages a night, it’ll end up pushed down below everything else the next morning when I start responding to my messages. Not good. With the tap of a finger, I can arrange for this particular email message to reappear as new in my inbox tomorrow, a few days later, Saturday morning, next week, someday (which is undefined, interestingly) or I can actually pick a date and time that’s even weeks in the future. Not quite sure about the repeat factor (does it just keep showing up as new forever?) but you can see that it’s quite easy to have it show up at lunchtime tomorrow, or even five years in the future. Yeah, deferring an email for five years is a bit odd, but you could do it! Pro Tip: While we’re talking about Gmail, know that I have a ton of Gmail help here too! Check it out while you’re here, please.